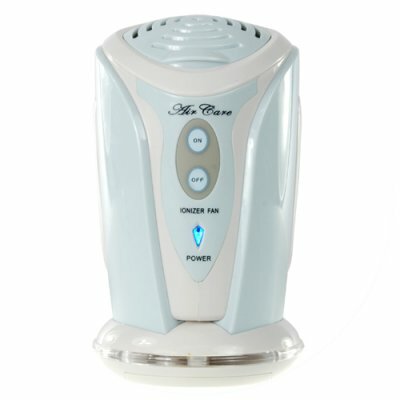 Successfully Added USB Ionizer Fan with Aroma Diffuser to your Shopping Cart. USB ionizer fan with aroma diffuser for efficiently cleaning the air around your desk or workspace. This whisper quiet USB negative ion generator (ionizer) is about the size of a can of fruit, so you can place it anywhere on your desktop and it will not get in the way. Since it can be powered by batteries or USB, it can simply be put where it is most convenient, then you can power it on and happily notice an improved difference in air quality within a few minutes! How? By generating negative ions the CVFR-H06 starts immediately ionizing the airborne particles which makes today's city air unhealthy so that they fall harmlessly to the ground. In addition, the aroma diffusion feature (with included aroma beads) helps to enrich the air and stimulate your brain for a more productive work day. This is an essential gadget if you are a pet owner, if you have carpeting in your home, work in a damp location, or if you regularly keep the windows open. It's also a must-have in urban areas what with all the smog and pollution that modern city-dwellers must put up with. Secure some new sales for yourself by stocking up on this new item to sell at your online / physical store or feature it in your latest eBay, Amazon or uBid listings and use our blind dropshipping service to maximize your limited resource of time. Offered exclusively by your favorite wholesaler - Chinavasion. Exceptionally quiet despite its powerful fan. Comes with a receptacle for aroma beads (included) to enrich the air. It has been said that negative-ion generators can help allergy sufferers by producing millions of negative ions which naturally bind to particles like mold, spores, dust and floating animal dander so they harmlessly drop out of the air.